Have you ever been stranded in the woods and need to start a fire but have nothing to do the task? Well we have the perfect gift for you! 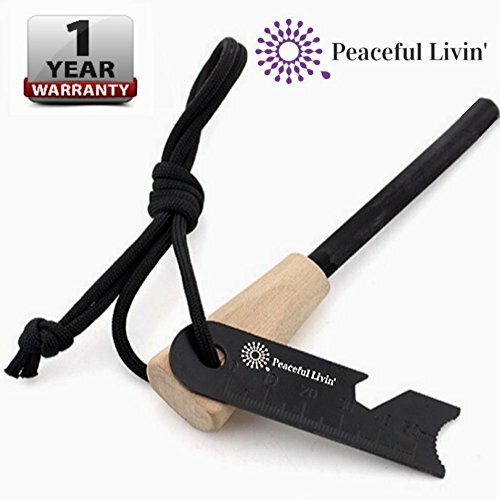 Our Peaceful Livin' Fire Starter creates HUGE sparks, making it very quick and easy to start a fire, wherever you may be! Live in Peace with wise preparation for Surivial and Camping. For Amazon Prime Members, Delivery is ONLY 2-Days so Buy it Now with confidence. A Sturdy, High Quality Build... Lasting for Many Years! LONG Flint Rod w/ a Steel Striker, and can also use the Scrapings to get a Big Flame for the Fire. Wooden Handle with a 1-Year Warranty! If you have any questions about this product by Peaceful Livin', contact us by completing and submitting the form below. If you are looking for a specif part number, please include it with your message.